Alternatives to Fluoroquinolones | The Medical Letter, Inc.
SINUSITIS — Acute sinusitis in adults is often viral and symptoms can be managed with analgesics, a nasal corticosteroid, and/or nasal saline irrigation. When it is bacterial, it is generally caused by Streptococcus pneumoniae, Haemophilus influenzae, or Moraxella catarrhalis and can be treated with amoxicillin or amoxicillin/clavulanate.2 The addition of clavulanate improves coverage of beta-lactamase-producing strains of H. influenzae and M. catarrhalis. Doxycycline is an option for adults who are allergic to penicillin, but resistance to doxycycline has increased, particularly among isolates of S. pneumoniae with reduced susceptibility to penicillin.2-4 A respiratory fluoroquinolone (levofloxacin or moxifloxacin) is an alternative for penicillin-allergic patients. Monotherapy with a macrolide (erythromycin, clarithromycin, or azithromycin) or trimethoprim/sulfamethoxazole is generally not recommended because of increasing resistance among pneumococci. In pregnant women, nitrofurantoin, amoxicillin, or a cephalosporin could be used to treat uncomplicated cystitis based on the results of susceptibility testing, but nitrofurantoin should not be given in the third trimester or during labor because it can cause hemolytic anemia in the newborn. FDA Drug Safety Communication: FDA advises restricting fluoroquinolone antibiotic use for certain uncomplicated infections; warns about disabling side effects that can occur together. Available at: www.fda.gov. Accessed May 26, 2016. AM Harris et al. 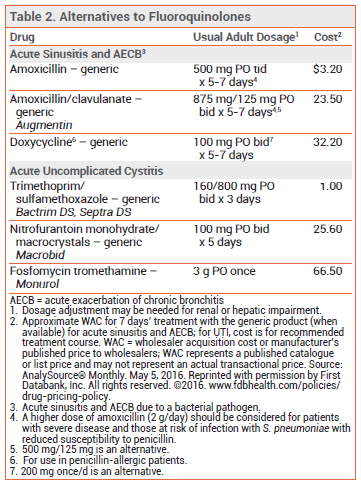 Appropriate antibiotic use for acute respiratory tract infection in adults: advice for high-value care from the American College of Physicians and the Centers for Disease Control and Prevention. Ann Intern Med 2016; 164:425. AW Chow et al. IDSA clinical practice guideline for acute bacterial rhinosinusitis in children and adults. Clin Infect Dis 2012; 54:e72. RM Rosenfeld et al. Clinical practice guideline (update): adult sinusitis executive summary. Otolaryngol Head Neck Surg 2015; 152:598. K Gupta et al. International clinical practice guidelines for the treatment of acute uncomplicated cystitis and pyelonephritis in women: A 2010 update by the Infectious Diseases Society of America and the European Society for Microbiology and Infectious Diseases. Clin Infect Dis 2011; 52:e103. Drugs for urinary tract infections. Med Let Drugs Ther 2012; 54:57. TM Hooton. Clinical practice. Uncomplicated urinary tract infection. N Engl J Med 2012; 366:1028.